If we switch one person from a simple nominal annuity to `one rank one pension', how much more expensive does the pension become? The traditional civil servants pension in India has proved to be very expensive. Bhardwaj and Dave (2006) estimated that the implicit pension debt on account of current civil servants alone, was already 64.5% of GDP. If one were to add new recruits to civil services, and military personnel, this would be even higher. Pension payments were growing sharply. In December 2002, the NDA government made a decision to move new recruits into an individual account defined contribution program, the National Pension System (NPS) . [link, link]. The reform was never carried over into defence even though that was long expected to be done the moment NPS had stabilised. As a consequence, we now run two parallel worlds: uniformed defence personnel are on the traditional civil servants pension while others have shifted out to the NPS if they were recruited after 1/1/2004. The present debate concerns one-rank-one-pension (OROP). 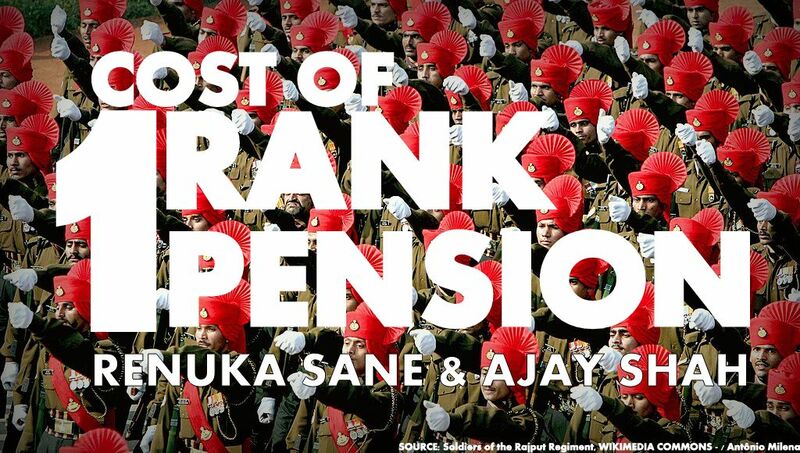 In order to understand the fiscal implications of OROP, we must calculate what it costs to produce such a pension. A pension, which is a stream of payments while the recipient is alive, is an "annuity". There are three kinds of annuities: nominal annuity, inflation indexed annuity i.e. where the annuity value is linked to inflation, and wage indexed annuity, where the annuity value is linked to wage growth. The third is the costliest and is also generally not produced by private insurance companies worldwide. In the extreme, OROP is tantamount to wage indexation i.e. the value of the pension is linked to the wage growth. Hence, in order to price a pension, we have to price the annuity embedded in it. The full information base required to make these calculations correctly can only be accessed through the government. In the calculations shown here, we make suitable assumptions and proceed. At every step, we have complete transparency about assumptions and computer programs. The gentle reader is requested to actually run the code, and experiment with modified assumptions. The program is written in the free statistics software system, R.
How to price a pension? Suppose we promise 100 people (all at age 60) that we will pay them Rs.1 per day for the rest of their lives. What is the cost of such a promise today? This depends on two things: the discount rate, and the number of people of this cohort who survive every year. Lets say that the last surviving member lives upto 100 years. This implies a horizon of calculation of 40 years. So in year 1, Rs.1 per day is paid to 100 people. In year two, if 2 people die, this is paid to 98 people and so on. This shows that as the age of the cohort increases, the number of people surviving decreases. Of the 100 people who start out at age 60, by age 75, roughly half are still alive. The data used here to calculate the survival function is the mortality rate of the general population. Survival is likely to be better for those with higher income and better access to health care, as is the case with employees of the government. Hence, our use of this survivor function makes annuities appear cheaper than they are in the context of government pensions. Once we have the survivor function, we work out the NPV of the annuity. Lets say we are paying Rs.1 per day or Rs.365 per year to this cohort, and that the discount rate is 7%. What is the cost of this promise? Why has the interest rate of 7% been chosen, for the next 40 years? Here is a long answer. The short answer: Because India now has an inflation target of 4%, and assuming this works, the real return on government bonds may work out to roughly 3 per cent. The code above yields an answer of Rs.3,163.22. This is a little lower than the price charged by LIC for this annuity, of Rs.3,800. That is to be expected, as our survivor function is of the general population, and not of the annuitant population. Also, our calculations do not take into account the administrative costs of providing the annuity. This gives us the price of a nominal annuity. Now let's make things more difficult, by introducing inflation indexation and wage indexation. In order to do this, we have to make assumptions about inflation and wage growth. India now has aninflation target of 4%. This suggests three scenarios for inflation: 3%, 4% and 5%. We also need to make a range of assumptions for wage growth. We propose three scenarios at 7%, 8% and 9% wage growth. At the baseline scenario of 4% inflation, these correspond to 3%, 4% and 5% real wage growth. How does all this change when retirement is at 35? The retirement age of the military is different from that of civil services. Approximately 80% of the military retires between the age of 35-40, 18-19% retires between the ages of 54 and 60. Only about 1% retire at the age of 60. This implies that expenditure on pensions will be incurred for a lot longer than if the workforce retired at 60. We estimate the cost of a pension for a person retiring at age 35. As before, we first estimate the survival function, and then the cost of the pension under a price and wage indexed annuity. The code above yields an answer of Rs.4,518.73 for the simple nominal annuity at age 35. This rises to Rs.7,488.54 for an inflation indexed annuity (assuming 4% inflation), and Rs.14,998.25 for the wage indexed annuity (assuming wage growth at 8%.). The survivor function is for the general population. Civil servants are likely to be healthier than the general population, and uniformed armed forces are likely to healthier than civil servants. When correct survivor functions are plugged into this calculation, annuity prices will go up. We have used the survivor function for males. Females live longer. Some employees are women. When this is taken into account, annuity prices will go up. We have used the mortality rate as of 2015. As life expectancy in India improves, this will go down, implying that more people will live till older ages. Annuity prices will go up. We have assumed that RBI will deliver on its inflation target of 4%. While our assumptions are conservative, we have assumed an extreme form of wage indexation. It is possible that some variant of OROP is constructed without full wage indexation. The estimates of the implicit pension debt would be lower in that case. We have also assumed a constant discount rate of 7%. If the discount rate is higher, the expenditures will be lower than those described here. We treat our computation for the nominal annuity for a 60 year old as the base line. For all other cases, the extent to which it is higher, in per cent, is also shown. We start at the old system: a nominal annuity at age 60. If we change this to an inflation indexed annuity, the implicit pension debt goes up by 35%. If we change this to one-rank-one-pension, the implicit pension debt goes up by 94%. If we do one-rank-one-pension at age 35, the implicit pension debt goes up by 374%. Civil servants are a tiny slice of the Indian economy. It was a real surprise when Bhardwaj and Dave, 2006, found that the implicit pension debt on account of the civil servants pension came up to 64% of GDP. This was an important impetus for the NPS reform. Uniformed armed force personnel are also a tiny slice of the economy. Even if all they had was a nominal annuity, this could prove to be quite expensive, as the pension starts at a young age, and the health of this group is very good. On top of this, there is the problem of rapid turnaround. On a horizon of 60 years, we go through four cycles of taking in a person at age 20 who retires at age 35, who will live till 80. Therefore, for each person who is presently serving there will be four alive who are drawing pensions. We may speculate that the implicit pension debt on account of the armed forces pension may also be in the region of 50% of GDP. If so, policy changes which double or triple the value of the annuity map to 50 or 100 percent of GDP. When such questions are being analysed, policy makers should arm themselves with the full calculations, before making decisions. Replace the general population survivor function, which we have used, with the actual survivor function for armed folk. We suspect they are much healthier than the general population. Use data for the stock of employees and pensioners, and rules about retirement, to work out the implicit pension debt associated with present or potentially modified pension arrangements. Once such calculations are in hand, the political leadership can choose between alternative uses of the same money. E.g. 50% of GDP could pay for complete suburban metro systems for 50 cities, or for 50 aircraft carriers. This research paper was first published at Ajay Shah's Blog under the title - What is the cost of One-Rank-One-Pension? on July 7, 2015 and has been republished under the fair user terms of the source blog. Towards Estimating India's Implicit Pension Debt by Gautam Bhardwaj and Surendra A. Dave, 2006. The Second International Workshop on The Balance Sheet of Social Security Pensions, Organised by PIE and COE/RES, Hitotsubashi University. India's pension reforms: A case study in complex institutional change by Surendra Dave, page 149--170 in `Documenting reforms: Case studies from India', edited by S. Narayan, Macmillan India, 2006. Indian pensionreform: A sustainable and scalable approach by Ajay Shah, Chapter 7 in `Managing globalisation: Lessons from China and India', edited by David A. Kelly, Ramkishen S. Rajan and Gillian H. L. Goh, World Scientific, 2006.